Bobbers have given 'stripping it down' a whole new meaning. Well, on a serious note the Indian Scout Bobber is the latest addition to the list of Bobbers or chopped, middleweight cruiser-esque motorcycles in the country. 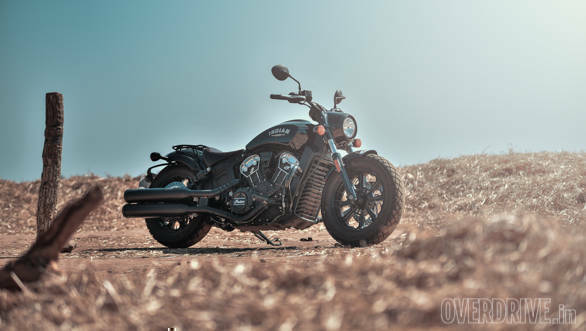 We have the Harley-Davidson Forty-Eight and Triumph Bonneville Bobber on sale already, and I have to say the Indian Scout Bobber is yet another interesting addition to the list. I say so because I for one wasn't expecting Indian Motorcycles to 'do' a Bobber considering how the brand has stuck with cruiser/touring format at least since Polaris took over. 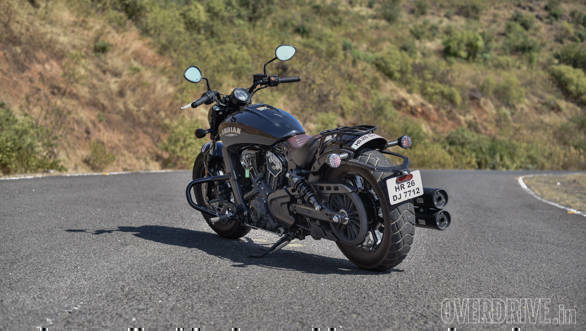 But Indian Motorcycles has executed the Bobber well and I am impressed with the design. A chopped front fender and fat front tyre are de rigueur when it comes to Bobbers and the Indian ticks these two crucial boxes. But more importantly, the addition of the little shroud above the round headlight helps distinguish its mug from the regular Scout's instantly. The fuel tank and fenders are finished in gloss black, while the rest of the motorcycle wears a matte black finish, in keeping with the 'dark custom' look bike builders love eternally. The twin exhausts are the same as the regular Scout  long and mounted horizontally  but look nicer here thanks to the matte black finish. The handlebar is shorter and is responsible for altering the riding posture, as on the Bobber you need to crouch forward slightly. 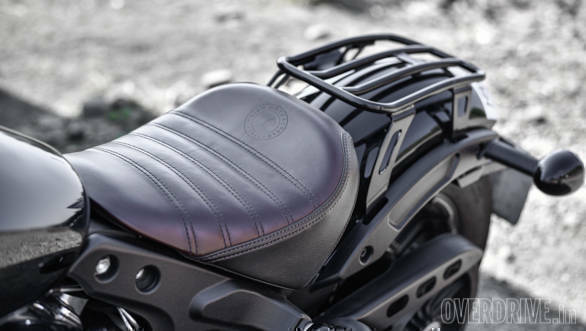 It's the rear half of the motorcycle that completes the custom look though, thanks to the single seat finished in tan leather, the luggage rack and chopped rear fender. The Scout Bobber also sits lower for the low slung stance Bobbers are known for, adding to its appeal. In typical Indian tradition fit-finish levels, paint quality and quality of plastics is excellent and the Scout Bobber feels properly premium. Attention to detail is immaculate and the Indian logo and name have been incorporated into various places on the motorcycle, and very neatly at that. The instrument cluster is the same single pod unit as the Scout. What I found rather irritating that the pass switch isn't a pass switch but is a toggle for switching displays on the little digital readout in the instrument cluster. It lets you swap between the tachometer, engine temperature and tripmeter, but every time I used it I only expected it to flash the high beam! 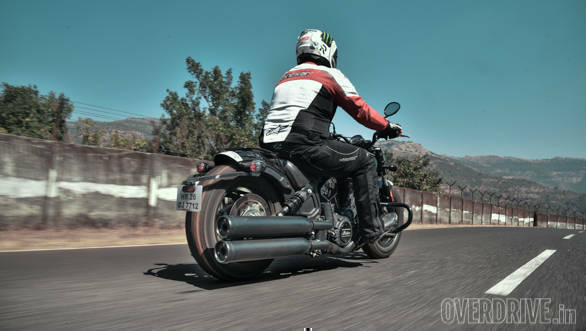 The Scout's powertrain has been carried over as is, which means the Bobber comes equipped with the same 1133cc, liquid-cooled V-twin engine that produces 95PS and 97Nm. These are impressive numbers for a cruiser. This engine has always impressed us with its refinement, as also the responses from its ride-by-wire throttle and the torquey feel at low to mid revs. The Scout Bobber thus feels quick, be it taking off from standstill or picking up pace on the go. There's not much to complain about on the powertrain front, except for the fact that the gearbox still feels slightly clunky and clutch action at the lever is hard, which makes it uncomfortable in stop and go traffic. 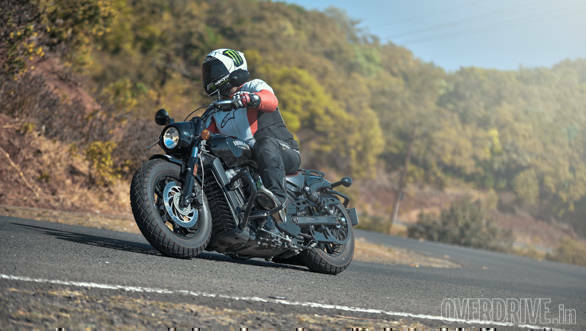 Riding the Scout Bobber through traffic and in the hills was a smile-inducing experience with its engine performance, but not when taking off from standstill. There were times when I accelerated hard and the lack of any support behind the seat meant I nearly slid off my perch! What's more, as is the case with all cruisers, the footpegs are very quick to ground themselves almost as soon as you lean into corners, which is a deterrent. The long feeler bolts don't help either but if you can get past the scraping sound, the Scout Bobber does want to lean into bends and its chassis offers more potential than what you might think. The strong midrange performance makes for rapid progress and the Bobber delivers in terms of being a light urban cruiser. You're better off shifting up early though as the engine begins to vibrate at high revs and there's isn't much shove at the top either. But there's a little catch to the likeable riding experience, which is the 50mm travel offered by its rear suspension, apart its stiffness. That results in a significant trade-off in terms of comfort. So the Scout Bobber will impress you with its handling as there's a sharp feel to its front end but the stiffer suspension and crouched-forward riding position together result in a backache. Matters get worse on broken roads and there were times when I had to slow down to a crawl to avoid the jarring effect. The suspension setup thus pretty much clears the Scout Bobber's intent. It is likeable as an urban machine either for commutes or sorties around town, perhaps a late night ride for coffee or an early morning breakfast run. And that is if you are planning to ride on smooth tarmac. The Scout Bobber isn't a bike to ride on bad roads and certainly not one you will want to take out for long rides. For longer durations in the saddle you'll feel a lot more comfortable on the regular Scout. Another spanner in the works is the Bobber's asking price of Rs 11.99 lakh ex-showroom especially when you consider what it brings to the table. It is a very good looking motorcycle, as was confirmed by the number of heads it turned on the road. The inquisitive looks and smiles (and a few thumbs ups) were enough to tell me the Scout Bobber casts a binding spell successfully. The Bobber is thus a motorcycle I'd like to see parked in my garage and admire for its design and the refined V-twin engine, but I'm not convinced I'll want to ride it for long durations.